Find other destinations that offer GO Airport Shuttle or search for other transportation providers at Gold Coast (OOL) airport. Gold Coast Tourist Shuttles offers shuttle trips from the airport to your hotel. The price is dependent on the number of travelers in your party. They actually do have a family rate, don’t be afraid to ask questions. You can save up on your traveling costs by booking our shared vans. A transport that offers a pick-up and a drop off molded on your tourist needs; a ride to Tamborine Mountain or just a getaway to Glitter Strip, Surfers Paradise. You can choose to travel upon arrival and departure with our transport service of private vans and experience the most of Gold Coast, able to take you as far as Lamington National Park or as near as Main Beach. After airport transfers, you might want to travel in a private sedan; we can transport you to different destinations, like enjoying a surf in Broadbeach. We can offer you the service of a local personal driver, available at every place in Gold Coast. They can take you to many escapes, the Kurrawa Surf Club , the Draculas Cabaret Restaurant, among other extravagant places. Our private SUV can pick you up at your hotel or at any tourist spot and take you on time at any event you might want to enjoy at every turn on the Gold Coast, like the Sky Point Observation Deck. Our taxicabs can be hired for a reliable transport at anytime. You can tell the drivers to take you to places like the Elabana Falls. You can make it to arrive at the Jupiters Hotel and Casino in a royal limousine with high-class chauffeurs. There is always time for family and friends. Book our bus-for-hire service to reach as many touristic places as you can - Arts Centre Gold Coast, Tallebudgena Creek, OReillys Canungra Valley Vineyards - and enjoy the ride. Gold Coast Airport is one of Australia’s finest airports. It is teeming with travelers from all over the globe. 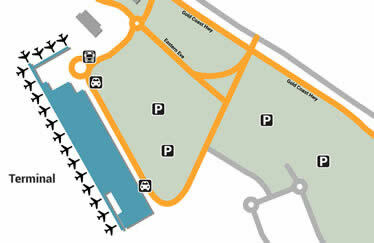 Our terminal map will help you navigate your way through the crowd so that you can get on to your trip to the land down under. You can reserve a hotel in Gold Coastor you can make discount airport transportation reservations. Australia’s Gold Coast airport is one of the best regional airports. Gold Coast also works with Surfside Buslines that run the public bus line to and from the airport. Those would be Routes 761 and 777. You will have to check route timeline for exact drop offs and pickups. Another form of service would be a minibus. Barnabus provide Minibuses for direct airport transfers to you hotels for a more private ride, also if your party is larger. Should neither of these shuttle services fit you needs, perhaps a limousine service would be more suited? Blue Diamond, Corporate, Royales, United, Vogue and Aussie Stretch Limousine offer limousines service for a more private ride from the airport to your hotel. Not a Limousine person, maybe just a private car? Business Class Transfers can take care of all your needs. However, there is still the offering of renting a car from any of the six rental companies servicing Gold Coast airport. Those companies include Avis, Hertz, Thrifty, Budget, Europcar, and Redspot. Still if even those choices don’t meet your needs maybe that of Gold Coast Cab might. It is the chosen cab service of the airport. Being in the Gold Coast provides you with amazing amount of choice for hotels both on the beach and off. The decision where to stay will be the hardest. Flights from across Australia, even those from Tokyo and Kuala Lumpur arrive daily. Should you be one of these passengers you’ll want to know your options for shuttles and area hotels. Like most major airports Gold Coast has a wonderful selection of both. On the beach, Soul Surfers Paradise, is an almost five star hotel. With complimentary self-parking, wireless Internet and an indoor/outdoor pool. It has spectacular views and is minutes away from interesting attractions. The Peppers Broadbeach is located near a bit of everything. Close to the beach, shopping, and a park. The Peppers sports four hundred and ninety nine rooms, all including a I-pod docking stations, plasma TV’s, wireless Internet and indoor/outdoor pools. The Turtle Beach Resort is where all the fun is at. Near Putt Putt Golf, Jupiters Casino and Pizzey Park Sporting Complex there isn’t a dull moment to have. Turtle Beach has four outdoor swimming pools, a water park, a full spa, and four spa tubs. The resort has three hundred and forty eight rooms all equipped with wireless high speed Internet. Where ever you choose to speed your time while in the Gold Coast it will definitely be an adventure.